Any animal that can be described as a robust, over-sized guinea pig gets my vote. They are found across most of the African continent. There are three types, the rock hyrax (Procavia capensis), the tree hyrax (Dendrohyrax dorsalis), and the yellow-spotted, or bush, hyrax (Heterohyrax brucei). They have rubbery feet and 34 teeth, and can live at 14,000 feet. 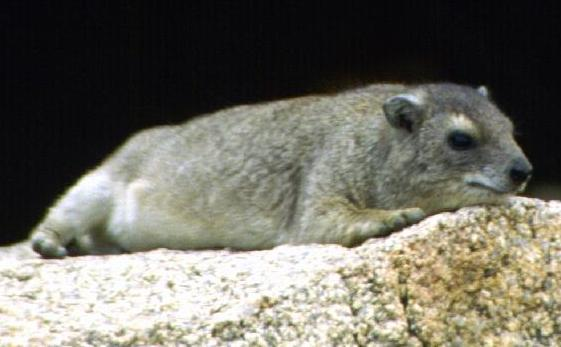 The rock hyrax is the socialite, chatting via shrieks and whistles in groups of 50 or more. The tree hyrax, in contrast, prefers to whistle in the dark. Apparently fossil remains indicate hyraxes the size of oxen once roamed the planet. The poor hyrax is actually implicated by creation scientists as disproof of horse evolution. I've never met a hyrax but if I did, I would call it Glenda.